Hollywood apologist Sean Penn. Photo source AP. We already know that propaganda agents of Hugo Chavez resent being identified as such. From Gregory Wilpert, a once so called German - American independent scholar who was 'conducting research' in Venezuela, to Eva Golinger, who went fresh out of college in the USA to publish propaganda books in Cuba owing to her fanatic apologising for Chavez, these supporters of Hugo Chavez, are a bunch of foreign radical leftists that saw a window of opportunity with the Chavez regime, and are handsomely profiting from it. While in Venezuela, Wilpert married with Chavez's current consul in New York, therefore he's living a diplomat lifestyle at the Venezuelan taxpayer expense, and Golinger is becoming a household name as an 'advocate for social justice' in Russia, Cuba, Iran, Libya and Venezuela, for which she's getting princely sums. Unfortunately, for Wilpert, Golinger et al, the international media is no longer buying their line, or that of their paymaster. From Human Rights Watch, to the New York Times, fewer and fewer leftists are prepared to throw their lot behind Chavez. 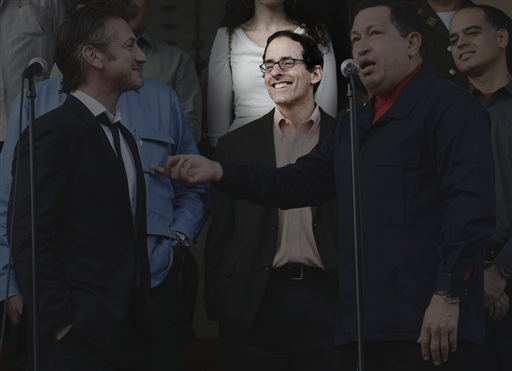 The last man standing, in the closely knit circle of Americans-for-Chavez propagandists, is one Mark Weisbrot, highlighted in the picture above. Rumour in Washington has it that this man got $100,000 for writing the script of South of the Border. There is evidence that this individual has lied -on record in the senate of his own country- to the effect that Eva Golinger never got a penny from Venezuela. He is quoted in some publications as being the "architect" of the Bank of the South, one of Chavez multiple hare brained projects that never materialise. He has gone to extreme lengths in defending Chavez over the years in the USA, publishing -in his own website- 'papers' that never undergo peer-review processes, even entering into academic debates where his views have been properly discredited. The last set of accounts of the organisation he co-chairs with another hack-for-rent (Center for Economic and Policy Research or CEPR) are from 2009 (this organisation is not to be confused with London-based CEPR). The organisation got $1,219,461 in "Gifts, grants, contributions, and membership fees", while it does not disclose sources of funds and related amounts. why does a man who derives a salary for analysing US economic policy (according to submitted records), spend so much of his time writing, agitating, and apologising for Venezuela's dictator? Does he do all that for free? Who pays his pro-Chavez travels to Venezuela, and other countries? Why is he not registered with the US Department of Justice's Foreign Agent Registration Unit? Why are his lobbying expenses not shown on records of his organisation? How can he explain that former Venezuela Information Office agents, such as Deborah James and Alexander Main, are now his employees? Given the criminal nature of the regime he so feverishly defends -for free Weisbrot would like us to believe- it would not be surprising that he's getting his due in cash, or through undeclared transactions. As his other co-conspirators, Weisbrot had it coming. Sooner rather than later we will know how much his allegiance to Chavez cost Venezuelans. Ewwww!!! Talk about a truly creepy look on one's face!